At 35 weeks pregnant, I’ve now gone back and forth for the last 20 or so weeks over how I should write this, or if I should write it at all. You see, it’s personal, and the internet, well, it’s public. But what kind of person would I be if I couldn’t share my mistakes with you all, who also care so much about health and wellness? In the end I’ve decided that this is the right thing to do. Although it means admitting I messed up, it was a humbling experience, and one that I’m fairly certain many of us have gone through or will go through, as we ladies deal with pregnancy. I also want others to realize that these struggles happen to everyone, even trainers with specializations in nutrition. I now feel better equipped to help people that may run into these issues, having now experienced them first-hand. 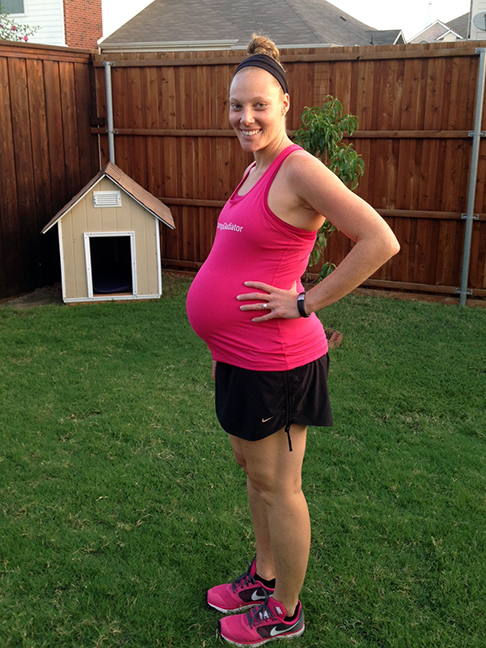 If you read my Life Changes post, you know a little bit about my mental state upon learning I was pregnant. Excited, nervous, scared, stressed, stressed and a little bit stressed. All of a sudden I found myself questioning my own knowledge. Not being a dairy-eater, I found myself craving cheese and wondering if it was because I wasn’t getting sufficient calcium? Am I missing other nutrients because I don’t consume meat? Is my baby okay? I found myself stressed, nauseous and consuming foods I hadn’t eaten in years. I got numerous comments from friends, family, clients and gym members “oh you’re going to be the cutest pregnant person ever” which added a level of stress I can’t really describe. I felt like everyone had unrealistic expectations of me. “Why am I going to be cute, because I’m a trainer? Because I’m supposed to be thin, cute, happy and pregnant?” I was stressed and unable to eat any sort of vegetable without gagging. This was going to be a long pregnancy. Several weeks later, I found myself feeling awful from a less-than-ideal diet, still nauseous and packing on pounds at a rate faster than the typical pregnant woman should. I had to have a serious conversation with myself about what I was doing. Although we’ve acknowledged that I was scared, stressed and nauseous, causing me to consume foods I wouldn’t normally even consider putting in my body, I think I also thought I was immune to the science of nutrition. You know the “since I’ve been so healthy for so long, I can eat whatever I want and it won’t affect me” kind of mentality. Not sure what was happening upstairs, but this is definitely NOT true. I’m human just like the rest of the world, trainer or not. And when I started eating pasta, bagels, cookies and crackers instead of spinach, vegetables, fruits, lentils, etc., my mental and physical state declined rather rapidly. It was at about the 15 week mark that I realized I needed to get my head out of my “you know what” and pull myself together. Whether or not I could stomach a vegetable no longer mattered. 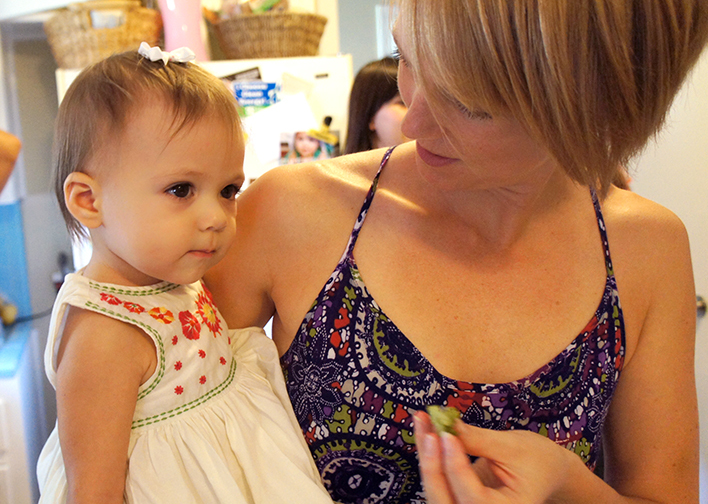 My baby NEEDS proper nutrition and it’s up to me to provide that. I also realized that I could either live the remaining 25 weeks like this—miserable—or I could make a change. With that, I got myself back on track. And wouldn’t you know it—soon I started to feel MUCH better! The next 15+ weeks were much improved. I still had some food issues but not nearly as bad as the first 15 weeks. I was juicing vegetables (and still am) to ensure I was getting them in my diet (still can’t choke those things down without throwing them in the juicer), started drinking my Amazing Meal smoothies again, and life was looking up. I’m due with our sweet baby in 5 weeks. I never really regained my appetite for clean eating, or an appetite at all really, but have definitely been making healthier decisions. As nauseous as I am today, eating healthier has allowed me to feel better physically and mentally. Pregnancy is a funny thing—I’ve decided that you can only be so hard on yourself for the crazy things your body is enduring, but it’s also important to not let yourself go off the rails. There are two people relying on you for the proper nutrients, so cookies for dinner is not acceptable. Nor is two or three bagels in one day…yikes, glad that’s in the past! Oh, and it turns out, all that second-guessing about my pescetarian, dairy-free diet was a waste of energy. Much needed energy, at that! It is perfectly okay to be a pescetarian, vegetarian, etc., you just need to ensure you are getting the proper nutrients in sufficient amounts through other food sources. Find a good, natural pre-natal vitamin, do your research, involve your health care provider and employ a good support system and you will be just fine. Oh, and if your health care provider tells you otherwise about not eating meat, dairy, etc., it’s probably time to find a new one! Good luck to all the mommas-to-be out there! Note: I am not a doctor and do not claim to be one. If you have questions about your vitamin and nutrient intake, please consult a qualified nutritionist or medical practitioner. I came across this quote while waiting to pick up take-out from my favorite neighborhood Mediterranean restaurant. The final line of the quote struck something so deep in my heart that I found myself tearing up then nudged my mom standing beside me and pointed to the framed quote. Once she finished reading she looked over at me and we both smiled and choked back unexpected tears. Such a simple and beautiful statement about the choices we have in life. It reminded me that every day we are fortunate enough to live our lives and have the opportunity not only to impact ourselves and how we feel, but also those around us. Helping those around you make healthier lifestyle choices, such as going for walks with a friend who might not have the motivation to do it on their own, or bringing fresh vegetables or fruit into the office instead of the usual baked goods or sweets are simple ways to show kindness and love for those around you. With the coming holidays, there will be several opportunities to show kindness to your fellow human beings. You can make a positive difference by contributing nutritional dishes and snacks and taking the time to be active with friends and family. Growing up I witnessed my mom struggle through numerous fad diets – Cabbage Soup Diet, No Carbs Diet, Fat-Free Foods Diet, etc. I also noticed that although she may have reached a goal weight utilizing these fad diet methods, but she could never maintain it. However, no matter what fad diet my mom was trying, she and my dad continued to prepare healthy, balanced meals for the rest of the family that included vegetables, lean proteins, and healthy starches. For that, I can’t thank my parents enough. They helped me learn the importance of including a variety of foods and nutrients into my every day eating. The struggle that my mom, and millions of men and woman across the country have encountered, is keeping the weight off while maintaining a normal lifestyle. The origins of the word diet comes from the Greek word díaita, which means, “way of living.” We have to re-train ourselves to make good food choices on a daily basis, which means buying and cooking whole, nutrient-rich foods as part of our lifestyle. Another pitfall that my mom and many others face when it comes to eating well consistently is treating food as a reward. I grew-up thinking I could eat as much as I wanted as long as I stayed active and “worked it off.” To an extent, I believe this is true. Your body definitely needs sufficient fuel stores to perform strenuous physical activity, however, the kind of calories you are putting into your body is what matters most. Healthy eating is a never-ending journey and should be viewed as a continuous education. The more you learn the better off you will be to make informed choices and do what’s best for your body. As I’ve stated before, I love food. I do not enjoy eating strictly as a means to fuel my body, but rather as an opportunity to indulge in nature’s most delicious offerings. Let fresh, whole foods be your reward and be sure to balance your díaita with activity and movement. This recipe is gluten-free, dairy-free, soy-free, nut-free, grain-free and vegetarian. When shopping at my favorite local farm in Austin, I picked up a few baby eggplants and asked one of the farmers for recommendations on the best way to cook these beautiful little gems. She suggested to not cook them at all, but to slice them raw into thin slices to best enjoy they’re sweet, light flavor. Wanting to balance the sweetness of the eggplant, I paired them with quick-pickled onions and arugula for a slightly sour and spicy contrast. In a small, non-reactive saucepan, heat the vinegar, sugar, salt, seasonings and chile until boiling. Add the onion slices and lower heat, then simmer gently for 30 seconds. Transfer onions and liquid into a far and refrigerate until ready to use. Rinse quinoa and cook according to directions. Let cool. Toss arugula, eggplant, pickled onion (along with 1 tsp. pickling liquid), quinoa and oil in a bowl. I made this salad part of a satisfying meal by serving it alongside baked sweet potato fries. For an extra flavor and protein boost, add shavings of parmesan cheese before serving the salad. Using local, seasonal ingredients like eggplant and arugula are a great way to ensure your getting the most nutrition and flavor from your produce, not to mention the environmental advantages of buying local! If you like this recipe, try our Grilled Sweet Potato and Quinoa Salad. This recipe is gluten-free, soy-free, nut-free and dairy-free. 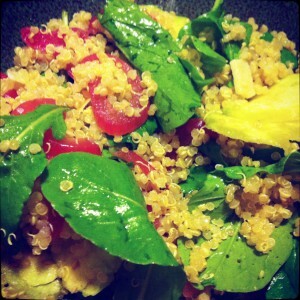 This recipe is one of my favorites from CLEAN by Dr. Alejandro Junger. 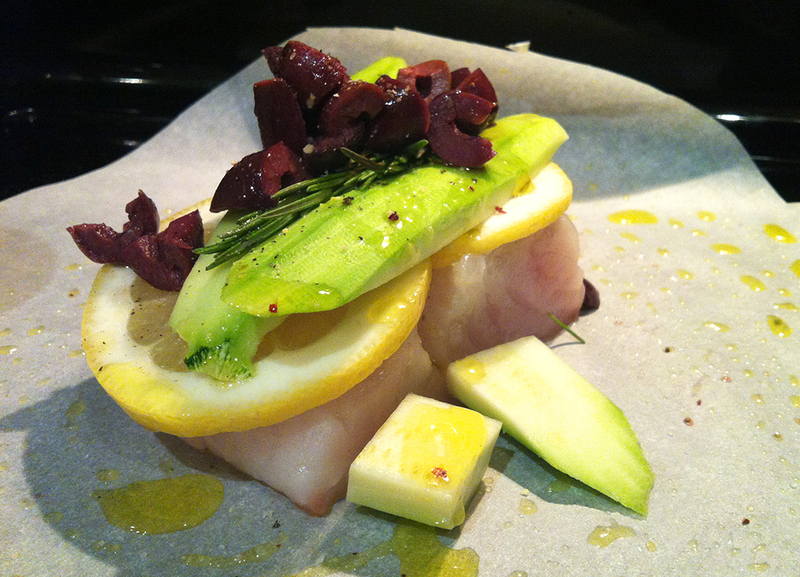 The halibut is light but filling and the zucchini, lemons, olives and rosemary add a unique and refreshing touch! And best of all, it’s EASY to make! Brush each parchment sheet with olive oil. Place one piece of halibut in the middle of each sheet and season with sea salt. On top of the fish, first place three slices of lemon, then three slices of zucchini, then top with a sprig of rosemary. Sprinkle the olives over the top and drizzle with olive oil. Pull the sides of the parchment together like a calzone. Fold paper over and crinkle together to seal. Place each package on a baking tray and place in the lower third of the oven. Bake for 12-15 minutes. The paper will puff up and brown lightly. Remove from oven and place on plates to serve. Open packages at the table and enjoy! I decided to change the way I eat about five months ago and incorporate a mostly plant-based diet. After watching the movie Forks Over Knives (as well as other influential books and movies), I was not only inspired, but also a little shocked to discover such a different point of view when it comes to the “healthy” food I thought I had been eating all these years (i.e. low-fat dairy and lean meats). Once I realized that I didn’t have to have all of my protein and nutrients come from animal-based products, I began my search for plant-based recipes and foods. It was exciting and fun for the first few months. I felt challenged to create new dishes and staple meals that incorporated all of the nutrients and ingredients needed to be a healthy Vegan. However, a few weeks ago I hit a food slump. I love food and using fresh, simple ingredients in my cooking, and I realized that I was no longer cooking for love, I was cooking for fuel. Being 100% Vegan takes a lot of dedication and time, especially if you try to avoid things like soy. Then there are the really hard-core Vegans that don’t even use honey or oil (with the exception of coconut oil)! Anyway, it was starting to frustrate and exhaust me. The ingredients lists were getting longer and longer just to create a variety of meals that were not only delicious, but that also included the nutritional value I needed. Bingo – that’s it! I’m striving to make good, well-informed decisions every day, starting with what I put into my body to spending time with family and friends, and that is what really matters when all is said and done. For me, that means incorporating a mostly plant-based diet, but also enjoying some of the simple, non-Vegan foods and flavors that I love so much. If and when I do stray from plant-based foods, I make sure that I am still eating responsibly and ethically – a smattering of fresh, creamy goat cheese from my neighborhood farm spread over a piece of warm, crusty whole wheat artisanal bread topped with the sweet, complex flavors of sliced purple, green and red heirloom tomatoes. Now that’s a compromise I can live whole and be free with. If you’re like me, long-term meal planning is typically something reserved for party planning only. Although I make my weekly shopping list, which may even include some specialty items from a recipe I’ve wanted to try, I tend to go for the same staple items and whatever is in season at the Farmer’s Market. By the end of the week I find myself standing in front of an open pantry, searching for inspiration to utilize the remaining produce in my fridge. At this point I am always grateful for the following “must-have” pantry items. With these items on-hand, delicious and healthy meal options are only minutes away. No need call in take-out or dig out that frozen pizza in the back of your freezer. Here’s a list of pantry necessities that can lead to a multitude of yummy, healthful family meals. Cranberries, Raisins, Dates, Blueberries, Apricots, etc. Keep a stash of any one or more of these dried fruits in your pantry to add to salads, rice dishes, homemade trail-mix/energy bars/recovery bars, chicken salad and more. Health Benefits: Great sources of fiber and vitamins. Almonds, Walnuts, Pine Nuts, Sunflower Seeds, Pumpkin Seeds, Flaxseed, etc. As with dried fruits, nuts and seeds add texture and flavor to salads, grain dishes, and snacks. They’re also great additions to sweet treats and desserts, like Raw Brownies! Health Benefits: Excellent source of protein and nutrients as well as providing heart-healthy unsaturated fats. Whole grains provide a filling and delicious base to any meal. Cook grains in large batches and use throughout the week in salads, soups and side dishes such as this Quinoa and Green Bean Salad. Health Benefits: Whole grains are made up of complex carbohydrates. These complex carbohydrates give our bodies the FUEL we need, the energy that most of our body systems need to function. Black Beans, Chickpeas, Lentils, Kidney Beans, etc. I like to buy these items in bulk (dried) and prepare large batches at the beginning of the week. 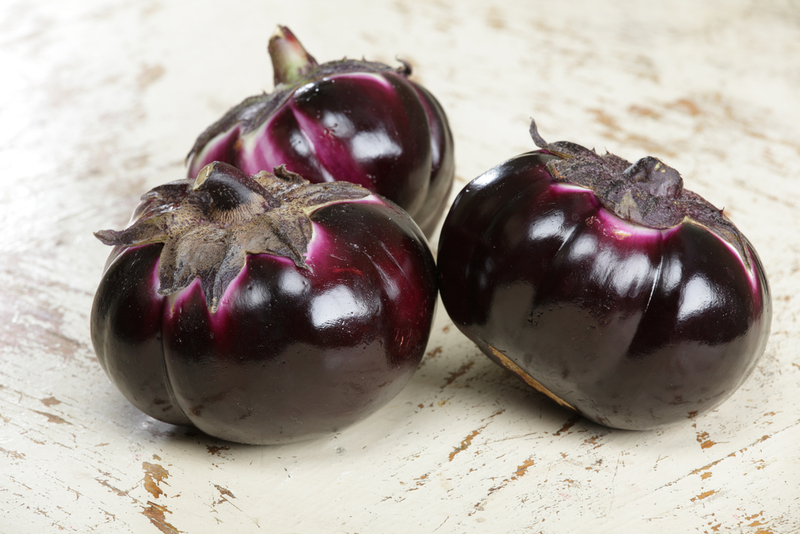 They can be an excellent side or as part of any main dish. Beans and lentils lend themselves to a variety of flavors and uses—Get creative and see how other cultures utilize these power foods! Beans and legumes are must-have items for vegans, who rely more heavily on them for adequate daily protein intake. Check out our featured recipe for Lentil Dal. Health Benefits: Loaded with protein, fiber and minerals. These little morsels of rich, deliciousness have saved me from over-indulging my sweet-tooth many a time. When purchasing the chocolate chips, be sure they are organic with NO added sugar. As a satisfying addition to trail-mix, or melted to make these yummy Chocolate Apricot Nut-Bars, dark chocolate chips are a crave-curing go-to. For an even healthier alternative, try using organic raw cocoa nibs. This superfood can be used just as chocolate chips are! Health Benefits: Rich in antioxidants, organic dark chocolate helps protect and repair your cells from damage by free radicals. Organic raw cocoa nibs are full of antioxidants as well as flavonoids, amino acids and magnesium helping improve mood, reduce anxiety, increase energy levels and reduce symptoms of PMS. These are the absolute essentials that I keep my pantry stocked with regularly. When you’re either feeling creative, or just desperate, having a well stocked pantry can make all the difference in the world. 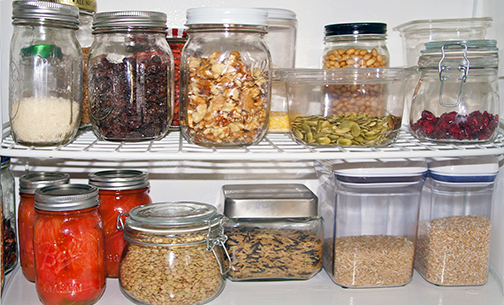 For more advice on Building a Natural Foods Pantry, 101Cookbooks.com has some great tips. Fresh, Local, Organic + Less Expensive Produce! I eat organic—no big deal. What is a big deal—spending a pretty penny to do so. I’m serious about my health and I won’t sacrifice eating conventional produce covered in pesticides to save a few bucks. Well, that and I won’t eat conventional because it tastes like crap… but that’s another blog post. The point is—I’ve recently come to the realization that I spend far too much money on groceries. You may or may not have heard of the whole “co-op produce” phenomenon. I was actually introduced to it just a few short weeks ago. A few friends mentioned going to pick up their “co-op vegetables”. Meanwhile, I stood there—vegetable-less—wondering what in the world they were talking about. I needed to find out. At Urban Acres, our goal is to provide our community with the very best local and organic foods while supporting Texas farm families and artisans. After inquiring about these co-op vegetables, it didn’t take me long to sign up for my membership online! Heck, I’ll try anything once! But this actually seemed like a pretty good deal. I signed up for a half share, which means every two weeks I get 15 lbs. of fresh, local, organic and sustainable produce for $30. Did I mention it is local AND organic?! Music to my ears. There’s nothing I love more than supporting local farmers and businesses. Besides eating organic… but I already covered that. There’s also a yearly membership fee of $50 and a one-time service fee of $14. Cool, I can handle that. Saturday morning I picked up my very first share of co-op produce. It was exciting and I felt proud to be supporting local farmers. I was also thrilled to be saving some hard-earned cash! There are several pick-up locations in the DFW metroplex. My pick-up location is actually about a mile from my house—so close! 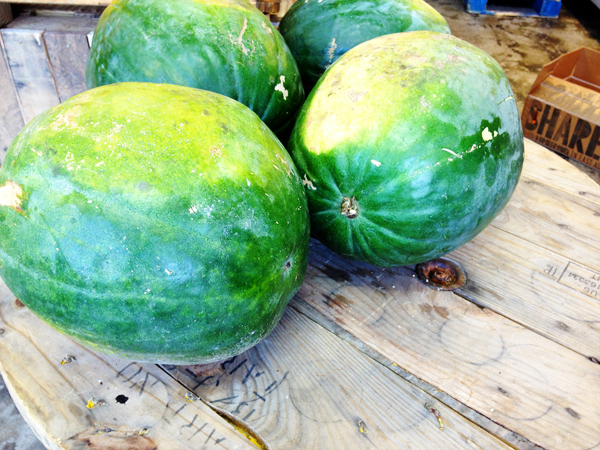 I signed in, got my bin full of produce as well as an enormous watermelon! 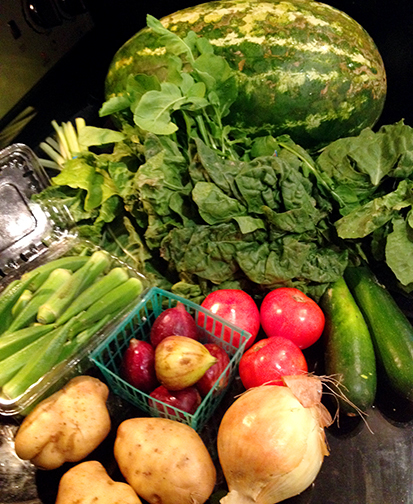 The contents of the bin change each pick-up, but in today’s produce included: watermelon, okra, potatoes, tomatoes, figs, onions, zucchini, romaine lettuce, swiss and rainbow chard and arugula. Wow, that’s a ton of produce! Although I don’t have experience with all of these wonderful items, the Urban Acres website provides some great recipe ideas! I can’t wait to try them out! So far, my experience with co-op produce has been an exciting one! I will keep you posted as my life as a co-op-er continues. Is that a word… “co-op-er”…? Well, it is now! On another note, I encourage you to check your area for co-op produce! Eating healthy is a necessity, but you shouldn’t break the bank in order to do so! Are you paying too much for produce?